Welcome to the IYT International Flotilla-Bareboat Skipper E-Learning course. This information, course, exam and theory course completion certificate are totally free of charge in order to promote international boating safety. To take the free course you simply need to register with IYT and pay a $0.00 invoice which you will be prompted to do. 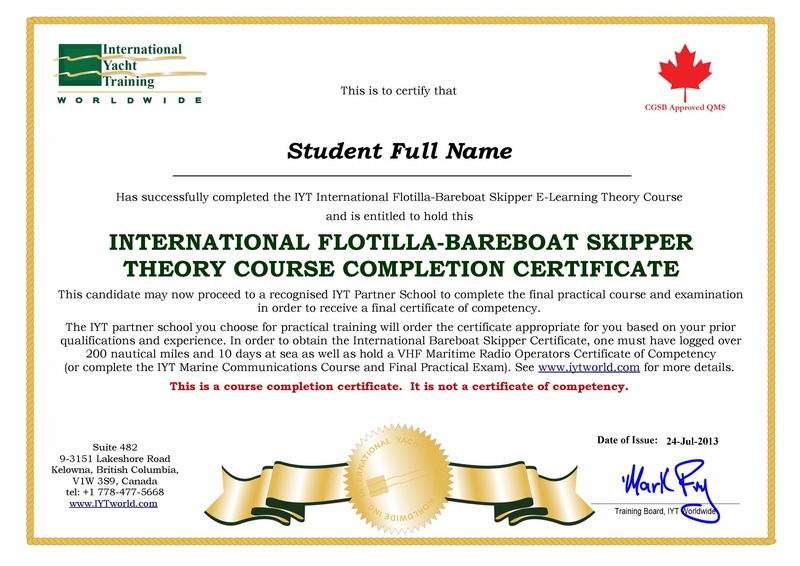 To obtain a final IYT International Flotilla or Bareboat Skipper Certificate of Competency you will be required to complete this online theory course and proceed to an IYT Partner school to take the practical portion of the course and a final practical exam.The "depth of knowledge" required for the theory portion of the International Flotilla Skipper course is the same as required for the International Bareboat Skipper course. However, the International Flotilla Skipper qualification is a great "stepping stone" to safely acquiring the 200 miles and 10 days at sea as required to progress to the IYT "International Bareboat Skipper" qualification. You will need to provide proof of prior qualifications and seatime to the school you choose for practical training in order to determine which certificate you are entitled to obtain.